Real Finca (traditional house of Ibiza) having preserved its original architecture while having been adapted to the modern tastes and the requirements of current comfort. 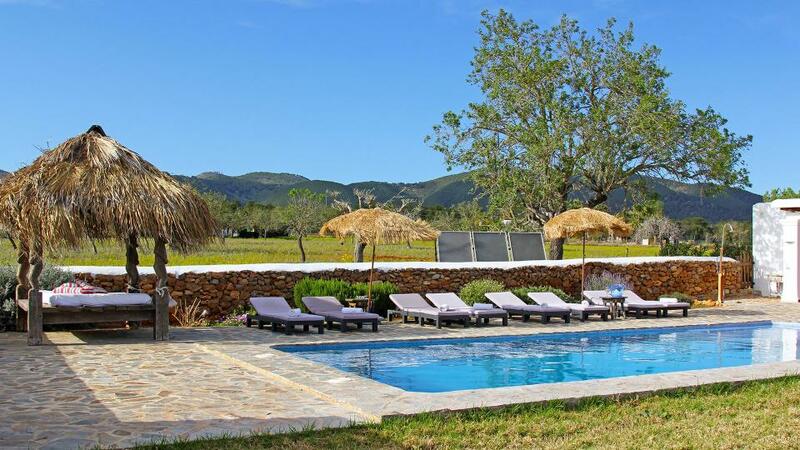 The house is located on a rural plot of 100,000 sqm on the road to San Mateo, just 2 km from the picturesque village of Santa Gertrudis, one of the most popular gathering places of the island and about 10 km from Ibiza city. The living space of 300 m² covers three different spaces, including the main villa, the independent space comprising the bedrooms, the pool and terrace areas, and finally, the garden. The house is not air conditioned, but due to the thick walls of traditional houses, it maintains a stable temperature throughout the summer. Access road unpaved but in perfect condition. Room, Ground level. This bedroom has 2 single beds. Bathroom outside the room, private, With shower. Room, 1st floor. This bedroom has 2 single beds configurable as a double bed. Bathroom outside the room, shared, With shower. Room, Ground level, direct access to the garden, direct access to the terrace. This bedroom has 1 double bed Queen size. Bathroom ensuite, private, With shower. Room, Ground level. This bedroom has 2 single beds. Bathroom ensuite, private, With shower. This bedroom includes also living area. Living room with fireplace, equipped with satellite TV, audio system and Wifi connection. Large kitchen with dining room, fully equipped with dishwasher, 2 refrigerators, oven, ceramic hob. Direct access to the outside patio and separate laundry room, with washing machine and dryer and ironing board. Private pool (12mx5m) treated with chlorine. Central covered terrace converted into a dining room for 12 people. Chill-out area with two large lounge chairs. Sun loungers and umbrellas for 12 people. Covered dining area with large barbecue. Outdoor parking for several vehicles. Thanks to its privileged location near Ibiza town, it is the ideal place for those seeking the tranquility and privacy of a private villa without giving up the convenience of being just a few minutes drive from the center city ​​and its hectic life.